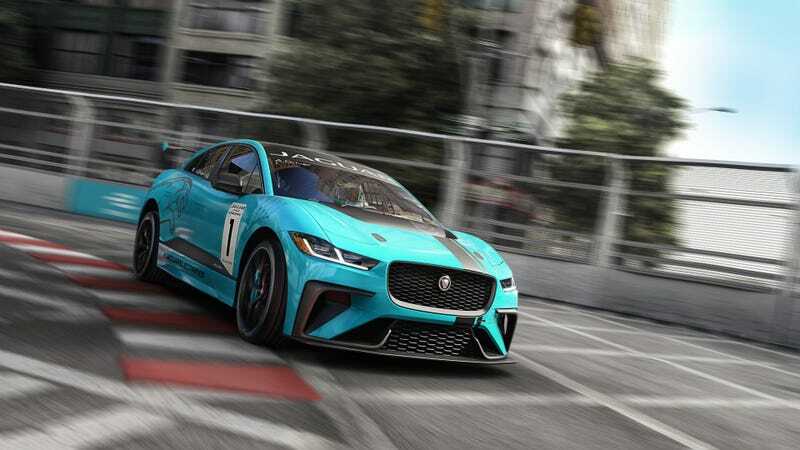 The 2019 Jaguar I-Pace is set to begin deliveries to customers by the end of the year, and now that there’s already the eTrophy racing version, the speculation for an I-Pace SVR has begun—but the humble planners at Jaguar think it could be too quick for people to handle. Jaguar’s head of product planning Hanno Kirner confirmed to Autocar that the automaker is thinking about how to do an electric SVR car, but there’s no official word on when Jag is actually going to build one. According to Kirner, they are worried about drivers being able to manage how quick they can make it. Jaguar’s Kirner stopped short of confirming an I-Pace SVR, but it seemes incredibly likely. He also said there could be a special SVX model for off-roading and a SVA model for those who want a super luxurious... compact electric crossover. While I am always hesitant at the concept of an automaker delivering a restricted vehicle to buyers, I do like the idea of an organized system for companies to train people on how to drive their cars. It seems similar to what Cadillac offers to customers of its V performance models already, though that isn’t mandatory. I’d feel much better knowing the person behind the compact crossover capable of hitting highway speeds before a sneeze is finished isn’t just some idiot with money, but I do worry it could be a little weird presenting a crossover as a special performance model worth jumping through more hoops for, and whether people will go for it. Whatever they end up doing, I hope they stick to their guns and deliver an I-Pace SVR with its full performance potential, fancy driving school or not.